Looking up from the bright huckleberry brush below Silver Peak, I see them coming around the ledge. Who knows, maybe they heard the trail crew banging on rocks on the Pacific Crest Trail. Curious, maybe they wanted to see for themselves what the silly hairless apes were doing down there. They saw and were not impressed, because they kept ambling along the cliffs and disappeared. 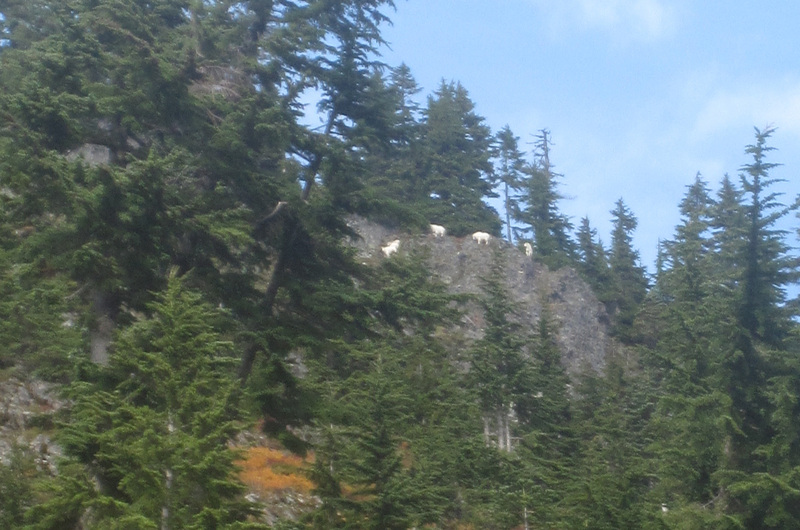 It’s always good to see them–mountain goats in the mountains. Oreamnos americanus is not really a goat. It’s closest relatives are four Asian rupicaprids and the chamois of Europe. They are all rock climbers, superbly adapted to mountainous habitat. Almost anything there is to know about mountain goats is outlined in Douglas Chadwick’s book A Beast the Color of Winter (which I might re-read, with winter bringing the time for such indoor explorations). Anyway, between the unexpected sunshine, still-bright colors, getting good work done with a good crew, and seeing goats–it was an excellent day in the woods. Great picture Deb. Not often you see something like this and have a camera handy. Great job you and your crew did on that blow down on the first big switchback on Cathedral Pass trail. Bill, sometimes you get lucky. I have a hunch they came around Silver Peak when they heard what we were doing to the rocks on the PCT. And that big log–I’m glad it was outside the wilderness so we could use the chainsaw. We are going through trail reports and sketching out projects for next season–the fun never stops!